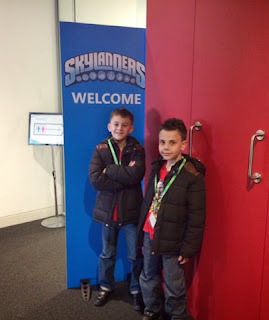 We were delighted to be invited to the reveal of the brand new Sylanders Trap Team, A brand new innovative Skylanders game. Skylanders® is redefining the toys-to-life phenomenon with yet another ground-breaking innovation, Skylanders Trap TeamTM. In previous Skylanders games, we brought physical toys to life inside the game. 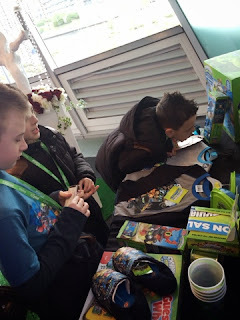 With Skylanders Trap Team, we are reversing the magic by bringing characters out of the game, into physical “Traps” that kids can take with them, effectively bringing Life to Toys. In Skylanders Trap Team, Kaos continues his ongoing quest to rule over Skylands. He has discovered the location of the legendary Cloudcracker Prison -- a fortress built entirely out of the magical substance TraptaniumTM and home to Skylands’ most nefarious baddies. In an attempt to build his own army of foes, Kaos blows up the prison, releasing the most wanted villains and blasting shards of Traptanium to Earth in the form of Traps. Now it’s up to Portal Masters to recapture all of the escaped villains using powerful Traptanium Traps and defeat Kaos before it’s too late! Skylanders Trap Team introduces a ground-breaking innovation that lets Portal Masters “trap” the most wanted villains in Skylands and then play as them in the game in the battle for good. The game offers an unprecedented new addition to the game’s play pattern in the form of Traptanium Traps. When this new type of toy is placed directly into the Traptanium PortalTM, Portal Masters can “capture” a variety of special villains from the game and magically transport them from Skylands into the real world. Players will experience an exciting new level of Skylanders innovation through the Traptanium Portal, a new ring of magical energy which reverses the magic of the toys to life category by letting players bring digital characters into the physical world. A built-in audio speaker allows players to magically hear the unique voices of the villains travel from the game into the real world Trap, and vice versa. The Trap also lights up in sync with the villain speaking, adding even more magic to the experience. If you look closely, you can almost see the villain trying to escape from inside the Trap. So now there are two Ways to Play – In Skylanders Trap Team, you can play as a Skylander or capture Skylands’ most wanted foes and unleash them for good. It’s up to Portal Masters to find these villains and capture them inside the new Traps that transport the villains into the real world via the Traptanium Portal. Once trapped, players can return the villain to Skylands as a playable character. This exciting new play pattern gives fans the option to switch between playing as a Skylander hero or a villain at any time, creating fun and unique “tag team” gameplay. Elementally Designed Traps – Themed Trap designs add variety to the collectible Skylanders Trap Team experience. Each Trap is elementally aligned, letting players capture villains who fall under that element. For instance, when Portal Masters explore the world of Skylands and encounter a water villain, they can insert a water Trap into the Traptanium Portal to capture that villain, as well as bring that villain back into Skylands as a playable character who helps in the fight for good. With each new trap added to their collection, Portal Masters unlock an exciting world of possibilities! Exciting New Adventure – Skylanders Trap Team features an all new adventure-filled story with fun and interesting new characters as well as returning franchise favorites. The game delivers a diverse and dynamic, story-driven gameplay experience, filled with adventure, combat, puzzles, mini games, activities, platforming, and drop-in/drop and out as well as co-op play -- all set within a variety of new compelling environments. With each new addition to their Trap Team collection, Portal Masters unlock exciting new gameplay possibilities within each level. Seasoned fans can play Skylanders Trap Team with their entire collection of 175 forward compatible characters from Skylanders SWAP ForceTM, Skylanders GiantsTM and Skylanders Spyro’s Adventure®. This exciting Skylanders Trap Team will hit our shelves in October of this year. We were very excited as we watched the preview and gameplay, the brand new characters looked amazing, and with an extra elements of gameplay using the Traptanium Traps gave a compleate new exciting element to the game. My boys are so excited and cannot wait to get the new starter pack.